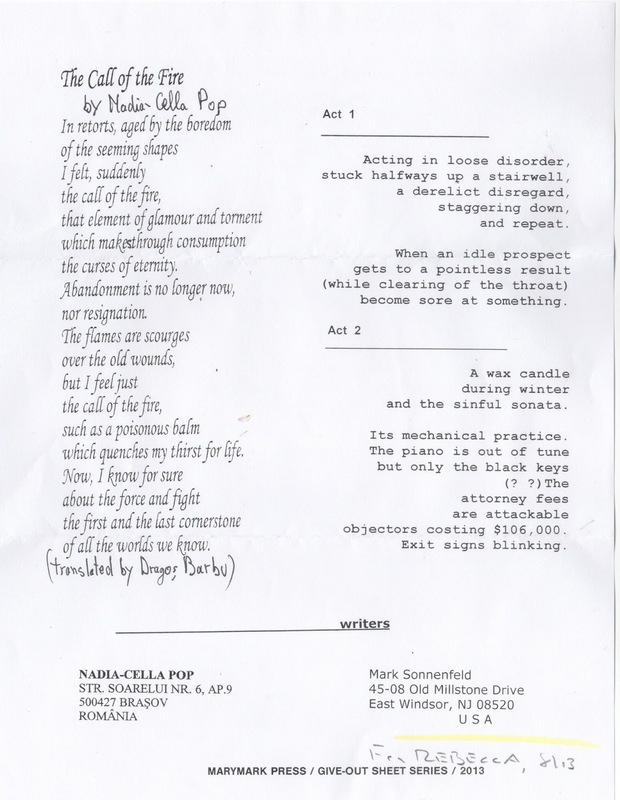 The Postal Ledger: Mark Sonnenfeld (NJ), a Marymark Press give-out sheet, newspaper cutting and experimental poetry! 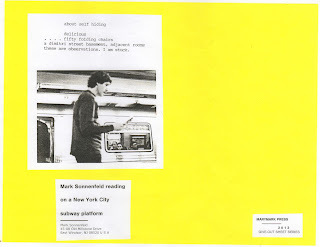 Mark Sonnenfeld (NJ), a Marymark Press give-out sheet, newspaper cutting and experimental poetry! Boredom and lonliness have never been states I've known, particularly, but now that so many of us can find each other with so much more ease, it feels as if the world is getting bigger and more exciting every day. Great to get this from Mark out of the blue! Great to hear his approach to collaborating widely (read the article) and how his writing world has come to be. His words are delicious to read and we all know I'm a sucker for stuff that inhabits that space where words and the visula intersect. It would be fun to collaborate some time. 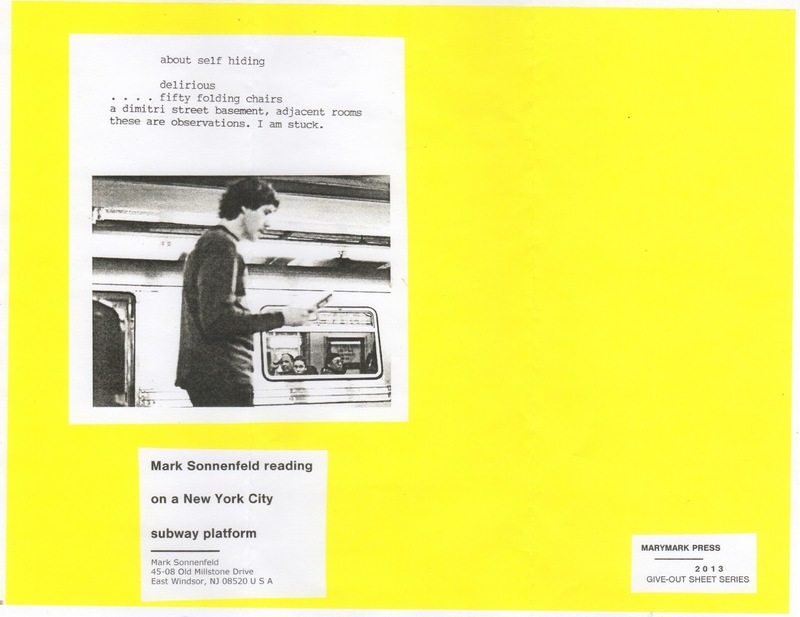 Mark Sonnenfeld is a unique creature in the small press. His world is one that lives at the intersection of poetry, word, and visual art. Many times his use of language has nothing to do with complete thought or meaning, but rather the splattering of words in a random cascade. We might call his work “experimental”, but for the fact that poetry, as one of writings shortest forms, lends itself to constant variation and experimentation. 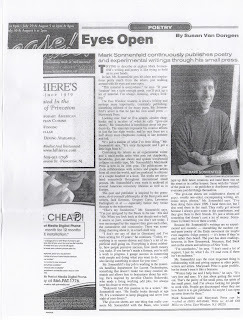 His new book, “typewriter art”is no different. 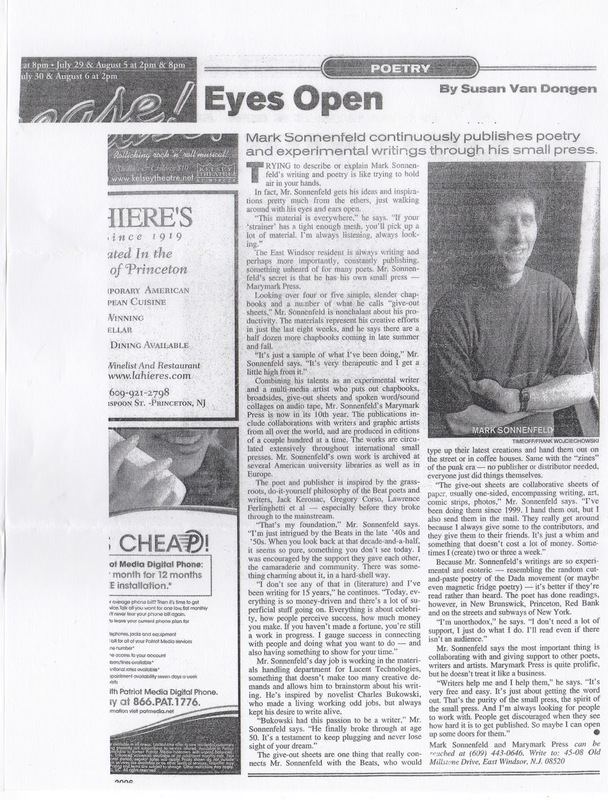 Dedicated to small press pioneer and all around good-guy Joseph Verrilli, he takes words, or rather the ink-on-paper-image of words, and collides them with a phrase. On page 8 we find word the word “Mark” in 68 point type face and below it the phrase, “Magazines from the stack”. On page 5 we find the phrase “I woke to head pressure” in 14 point type laid onto a page that has a series of letters extracted from words in 68 point bold black type face. His work is so conceptual that it is even hard to clearly describe – it must be both seen and read. So what is one to make of this? 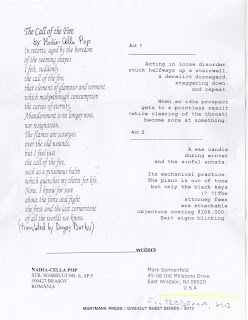 Is it poetry or is it visual art? Certainly it is experimental, and in each art form there is a mad scientist who will push the medium’s relevance toward the absurd, toward meaninglessness, through the trap door of context, and perhaps, toward yet new meanings. Will this become the rage? Will thousands of writers try to do what Sonnenfeld has done? I doubt it, but the highest form of flattery isn’t always imitation, sometimes it is our acknowledgement to artists like Sonnenfield that we have experienced their creation and encourage their continued exploration. The great literary unknown will be a richer friendlier planet because we have pioneers like Sonnenfeld orbiting the “word”.